To describe and understand the interactive physical, chemical and biological processes that regulate the total Earth system, the unique environment that it provides for life, the changes that are occurring in this system, and the manner in which they are influenced by human activities. • How is the chemistry of the global atmosphere regulated, and what is the role of biological processes in producing and consuming trace gases? • How will global changes affect terrestrial ecosystems? • How does vegetation interact with physical processes of the hydrological cycle? • How will changes in land-use, sea level and climate alter coastal ecosystems, and what are the wider consequences? 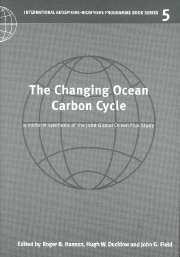 • How do ocean biogeochemical processes influence and respond to climate change? • What significant climatic and environmental changes occurred in the past, and what were their causes? The International Geosphere-Biosphere Programme Book Series brings new work on topics within these themes to the attention of the wider scientific audience.